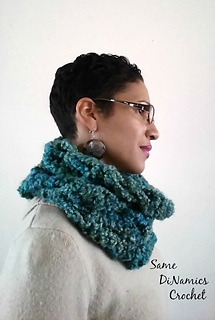 One Size 16" x 11"
This neck warmer is made using only one skein of yarn, making it quick and easy. It is also made in rows and then seamed in a tubular fashion. 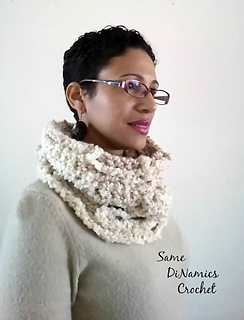 Allowing for the neck warmer to gather close to your neck for superior warmth. There’s no fussing with getting it to sit right, as it just drapes comfortably at the base of your neck. Red Heart Stellar, #6 Super Bulky, 90 yds. Samples shown in colors: Quark and Star. Only one size for this pattern. Gauge is not important. Chains at the beginning of each row will count as stitches. Always place your last dc in 3rd chain of turning chain, which will be referred to as “last st” in directions. 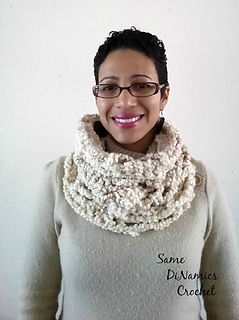 You can make your neck warmer longer or shorter if you’d like; just make your last row ending with a row 3 or row 5. This pattern is worked in rows not rounds. 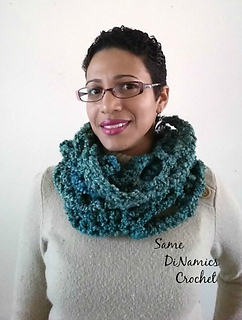 You will bring your sides together and seam it together to create a tubed neck warmer.